For those who haven’t yet ventured to Southeast Asia’s “Land of Smiles,” the prospect of planning a trip is understandably intimidating: Thailand is larger than the state of California and has 76 very different provinces, each with a distinct personality. So where do you even begin? Start by tossing out that dense guidebook. Here’s a simplified explanation of the country’s four main regions—and what to do once you get there. A tranquil alternative to bustling Bangkok, Thailand’s mountainous northern capital is an animal lover’s paradise, with elephant sanctuaries, tiger temples, and even a “nocturnal zoo” night safari. The five-star property is everything you’d expect from a Four Seasons—meticulous attention to detail, cushy accommodations, and over-the-top service—but it’s also decidedly authentic. Pavilion-style suites overlook sweeping rice paddies, and an on-site cooking school teaches would-be chefs the intricacies of Northern Thai cuisine. 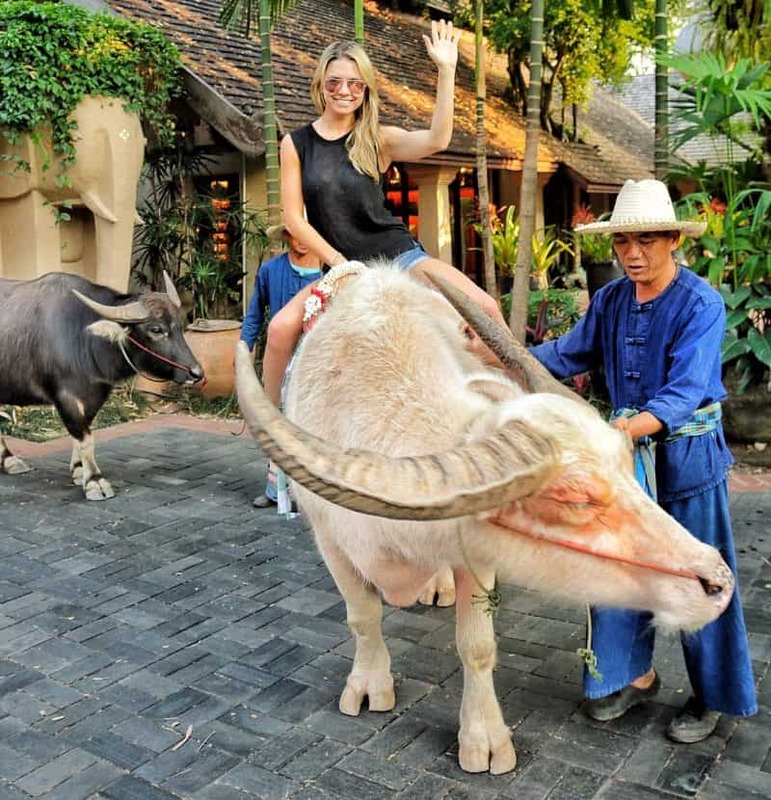 I was greeted by an albino water buffalo upon checking in to the Four Seasons Chiang Mai. Casual. There are plenty of camps to choose from in Northern Thailand, but few are as highly regarded as Patara, where participants are paired with their own dedicated elephant for the day. You’ll learn how to feed, bathe, and communicate with your animal under the tutelage of an experienced trainer; plus, a staff photographer captures the journey, leaving you with a library of Instagram-worthy snaps to take home. 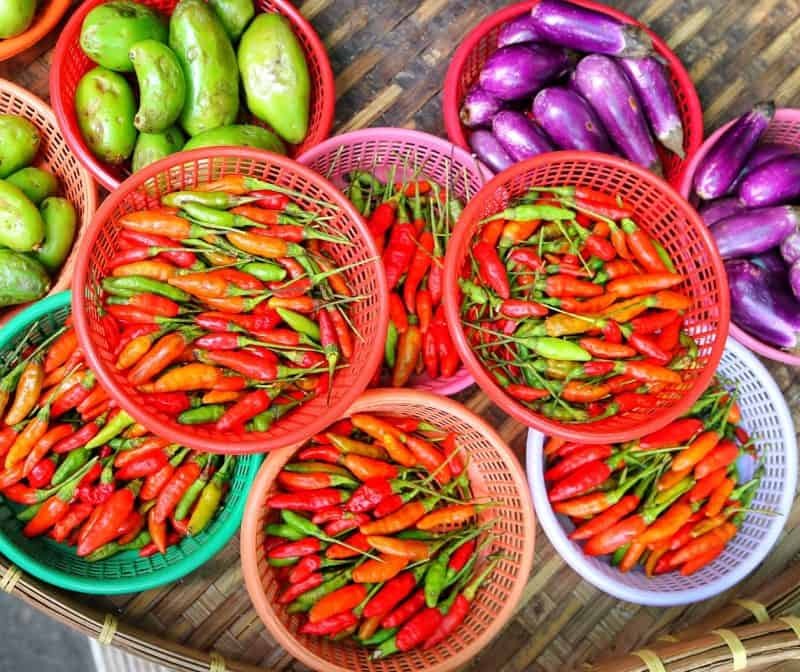 Known for its mind-numbingly spicy food, the region isn’t much of a tourist mecca, but quaint rural villages and lush rice farms showcase Thai culture in its purest form. If you’re longing for that middle-of-nowhere vibe but don’t want to sacrifice comfort—or a strong Wi-Fi signal—head to Muthi Maya. The bucolic 30-villa retreat is nestled within Khao Yai National Park, and nature-centric excursions (like trekking to the Haew Suwat waterfall) can be arranged by helpful hotel staff. In the same way that Italy is known for fine leather and Provence for fragrant lavender, Thailand is a haven for handwoven silk. The most varied selection can be found at Sri Thai Silk; be sure to leave plenty of extra room in your luggage. Thailand’s capital—situated along the Chao Phraya River—is sensory overload in the best way possible. Nearly everywhere you turn, you’ll find street vendors hawking hot plates of pad thai, tuk-tuks whizzing hurriedly past and statuesque temples looming overhead. 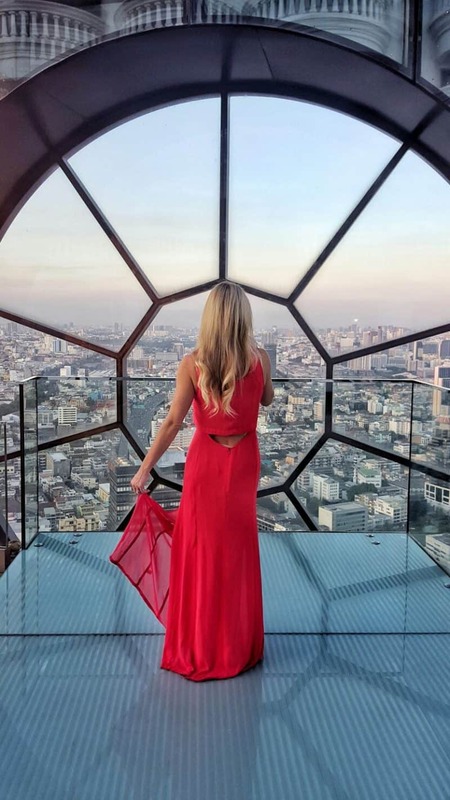 The view from Lebua State Tower, a hotel in Bangkok. Highly recommend having a drink at Sky Bar here. When you step foot into the hotel’s lobby, you’ll be greeted by a live orchestra and the scent of exotic flowers—400,000, to be exact—wafting through the air. The Oriental (as locals call it) is grand in every sense of the word, earning the property a reputation as Bangkok’s grande dame. Over the course of its storied 140-year history, the hotel has hosted an impressive roster of A-list guests, ranging from politicians (George H. W. Bush) to Hollywood starlets (Audrey Hepburn). Visiting a Buddhist temple is ostensibly a rite of passage for Thailand first-timers, and while The Grand Palace is Bangkok’s most renowned, it can also be an overwhelming experience: The temple sees more than 8 million visitors annually. Wat Pho, on the other hand, has all the trappings of a traditional Buddhist temple and a fraction of the foot traffic. 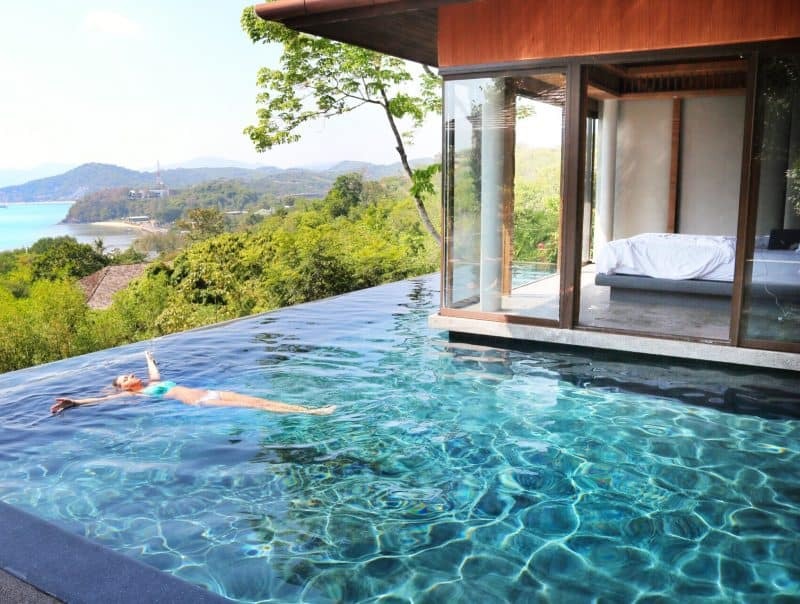 The pool villas at Sri Panwa are out of this world. I have stayed here twice – highly recommend it. There’s a reason why so many backpackers visit Southern Thailand and never leave. The postcard-perfect beaches and turquoise Andaman Sea will tempt you to make island-hopping your full-time job. Grab a daybed at Sri Panwa’s rooftop lounge for sunset and you’ll notice that the guests have one thing in common: They’re all impossibly chic. Fashion editors, celebrities, and Bangkok’s “high-so” (the Thai term for “high society”) flock to Sri Panwa, where you can choose to “see and be seen” or enjoy complete seclusion in a cliffside suite. You’d be hard-pressed to find more beautiful drag queens than those at Ka Jok See. The restaurant, which turns into a disco-era club around 9:00 p.m., is a Phuket institution. Guests are invited to dance on the tables as performers belt out hits from Beyoncé and Whitney Houston. Kate Moss even celebrated her birthday here—the ultimate stamp of approval, as far as we’re concerned.